Joliet Junior College hosted their 17th Annual Robotic Competition on Friday, February 10, 2017. This year, Citgo Refinery was a corporate sponsor for this event through a recent foundation grant awarded to JJC for “STEM Academy”. Over 100 high school students competed using Lego Mind storms NXT and new this year EV3 kits. Teams from 8 regional high schools learned about teamwork, creativity and careers in the robotic industry. The ISA (International Society of Automation) Will-DuPage Section sponsored the participants breakfast and 7 engineers not only assisted the students prepare their robots, but gave them some real-world career advice about the lucrative jobs in the field of robotics/automation. 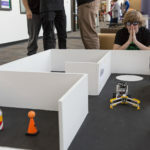 Teams of 4 students were in three levels, depending on their experience building robots. Beginner, Novice and Expert challenges were available. Not only do the students build robots using the Lego kit pieces provided, they also must follow the directions to program the robot to move. There are 5 challenges to the competition, and teams’ complete practice runs first and when they feel their robot is programmed and built properly – they ask the judges to time their creation. The goal is to have the fastest time in the challenge. All participants receive participation ribbons, and the 1st, 2nd and 3rd place teams receive trophies and medals. “The students worked so hard from 9AM-1:30PM that day, and was a great activity exhibiting leadership, teamwork, creativity and persistence from the high school students”, said Sue Doser, Career and Technical Education Specialist who coordinated this event.